One third of all vegetables and fruits produced are pollinated by honey bees. National Honey Bee Day was started by grassroots minded beekeepers to build community awareness of the bee industry, through education and promotion. Our commitment is to continue that philosophy. 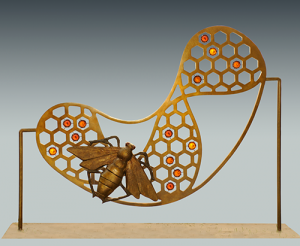 I will donate a portion of the sales of this or any of my other sculptures to The National Bee Day organization or a charity of your choice. Promotion and advancement of beekeeping. Educate the public to honey bees and beekeeping. Make the public aware of environmental concerns affecting honey bees. Consider beekeeping as a worthwhile hobby and seek information to get started. The more beekeepers there are, translates into more voices being heard. Support local beekeepers by buying locally produced honey and other beehive products. Honey is the best “green” sweetener you can buy. Attend and support beekeeper association events held in places throughout the year in most communities such as environmental centers, schools, and state parks. Educate yourself on the dangers and risks with homeowner pesticides and chemicals. Whenever possible, choose non-damaging and non-chemical treatments in and around the home. Most garden and backyard pests can be dealt with without harsh chemicals, which many times are nit healthy for the pets, the kids, or the environment. Get to know the honey bee. Unlike other stinging insects, honey bees are manageable, and are non-aggressive. Don’t blame every stinging event on the honey bees. Many times, stinging events are from hornets, yellow jackets, and wasps. Plant a bee friendly garden with native and nectar producing flowers. Use plants that can grow without extra water and chemicals. Native plants are the best to grow in any region. Backyard gardens benefit from the neighborhood beehive. Understand that backyard plants such as dandelions and clover are pollen and nectar sources for a wide variety of beneficial insects, including the honey bee. Dandelions and clover are a unwarranted nuisance for many homeowners. The desire to rid yards of these unwanted plants and have the “perfect” yard, are sources for chemical runoff and environmental damage from lawn treatments. A perfect lawn is not worth poisoning the earth. Consider allowing a beekeeper to maintain beehives on your property. In some areas, beekeepers need additional apiary locations due to restrictive zoning or other issues. Having a beekeeper maintain hives on your property adds to the overall quality and appeal of any country farm or estate. Know that beekeepers are on the forefront in helping communities deal with wild bee colonies in unwanted situations. Every township and community should welcome beekeepers. It is not the managed colonies beekeepers maintain that cause problems, it is unmanaged colonies. Every community should be able to rely on beekeepers and bee associations for dealing with honey bee related issues.Communities should not pass restrictive measures or ban beekeeping. Banning beekeepers means nobody may be around to help when help is needed. Get involved with your community with such events as offered at the local environmental center, volunteer programs at the county garden center, and other agriculture and nature based programs. No doubt you will meet a beekeeper. Beekeepers are not just people who keep bees. They are part of your community and many love nature on all levels. Beekeepers give generously to affiliated programs, as they are all connected within the communities in which we all live. Click here to learn more about the National Honey Bee Day program.